The Encinitas Union School District was one of two districts honored Thursday in the state Department of Education’s Green Ribbon Schools Program. The state program mirrors the federal Green Ribbon Schools initiative to honor energy efficiency, education on sustainability, and student health and wellness improvements. State Superintendent of Public Instruction Tom Torlakson nominated the Encinitas district for the national awards last month. The Encinitas Union School District was one of two districts in the state honored by the Department of Education’s Green Ribbon Schools Program for its comprehensive green initiatives. Photo by Encinitas Union School District web site. 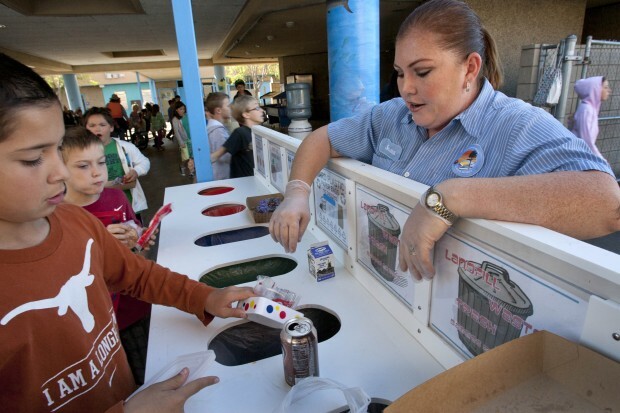 He said the Encinitas Union School District has reduced lunchtime waste by 85 percent by recycling and composting, has two large-scale organic farming efforts, takes part in farm-to-cafeteria programs and participates in National Wildlife Federation programs. The district serves 5,400 K-6 grade students in nine elementary schools, all of which have been recognized as California Distinguished Schools. District officials will be honored in June. Torlakson also bestowed honors on Santa Cruz City Schools and two campuses in Long Beach, Lowell and Twain elementary schools.